Congress Vice President Rahul Gandhi on Wednesday dubbed Narendra Modi as a "weak PM" for not raising the issue of H-1B visa in his talks with United States President Donald Trump and for playing down the use of the term "Indian-administered Kashmir" by the US. The Congress on its Twitter handle also criticised Modi's US visit, saying it was merely a photo opportunity and the main issues were bypassed. 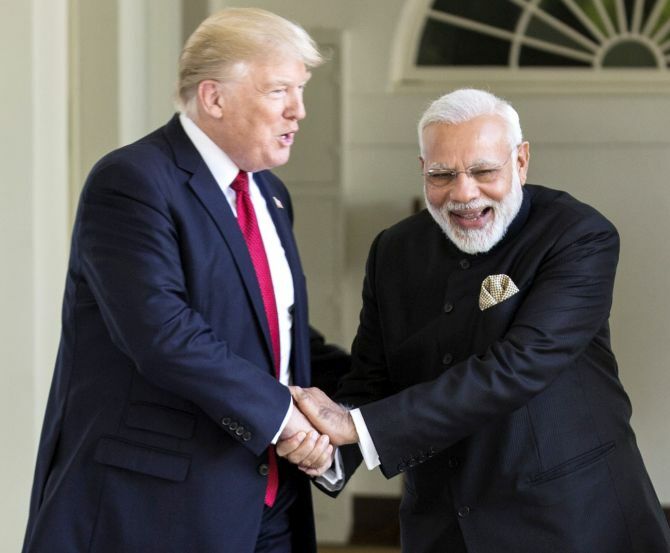 Gandhi tweeted some links of media reports that said "H-1B didn't figure in Modi-Trump talks" and "MEA accepts US use of 'administered Kashmir'". "India has a weak PM," he tweeted. India had played down the usage of "Indian-administered Jammu and Kashmir" by the US in a statement issued during the visit of Prime Minister Narendra Modi to the country last month, saying similar terms have been used in the past too. The Congress tweeted, "While it was a great photo opportunity, the main issues were bypassed on Narendra Modi's trip to the United States. #Unfruitful #WeakModi." It also posted a picture captioned 'no priority for Indian interests' along with the tweet. "PM Modi should have made an effort to ensure that issues of visas and the tech industry were discussed," it tweeted. The Congress had on Tuesday attacked Modi over his frequent foreign trips, saying they had not benefited India "even a bit" and that only time would tell about the gains from his current visit to Israel. Senior AICC spokesperson Ajay Maken claimed Modi's last "64 visits in more than 3 years" have catered only to domestic Indian audience through "televised shows" instead of ensuring concrete gains for the country. The Congress had earlier urged Modi to take up during his meeting with Trump, the issues of H-1B visa, racial attacks on Indians and cross-border terrorism from Pakistan. What does 2019 hold for Narendra Modi?